Amanda has been an RKOC club member since 1994 and a trainer since 2004. Amanda's training expertise focuses on beginner and advanced beginner obedience, rally novice and advanced, tricks class, and all levels of agility. Amanda joined the RKOC at age 7 and competed in juniors until she turned 18. She continues to compete in a wide variety of dog related events including Canadian Kennel Club conformation, obedience, Agility, Rally and Flyball. Amanda shares her house with Border Collies and Australian Shepherds. Over the years, Amanda has also had a Yorkshire Terrier, Shetland Sheepdogs, German Shepherd/Whippet and a Pomeranian. A kind hearted dog lover, Amanda has fostered many other breeds as well. Amanda enjoys training for the Regina Kennel and Obedience club as it gives her the opportunity to continually meet new dog and handler teams, allows time to spend with her own dogs, and enjoy many friendships that are made. In the past Cathy has also been in charge of the RKOC demo team. The purpose of the demo team is to offer dog related entertainment for seniors homes, schools, birthday parties and corporate Christmas parties. 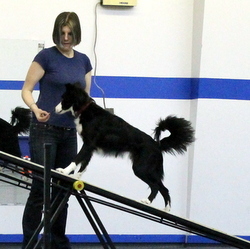 Cathy has attended a number of educational seminars which has enhanced her knowledge in both agility and obedience. 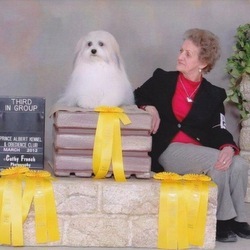 Her dogs have won titles in Flyball and Canadian Kennel Club Novice. 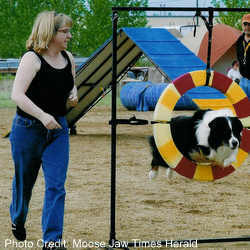 Cathy currently owns and trains an Australian Shepherd and North American Miniature Australian Shepherd. Other breeds she has owned include Shetland Sheepdogs, Golden Retrievers and Yorkshire Terriers. Cathy enjoys training classes for the RKOC as it gives her the opportunity to help people with their dogs. Lee has been a club member since 1978 and a trainer for fifteen years. She instructs beginner obedience, CKC Novice and Open, as well as spit and polish classes. 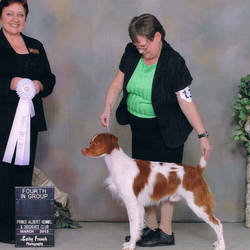 Lee owns a Brittany Spaniel who currently excels not only in the field, but also in the conformation ring. Other breeds that she has owned include German Shepherd, Brittany Spaniels and Doberman Pinschers. Lee enjoys the challenge of working together in partnership with the dogs to acquire titles and High in Trials as well as the many friendships made with other "dog" people. 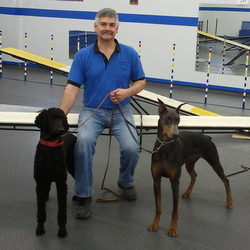 Rick is a long time Doberman Pinscher owner who has been an RKOC club member and instructor for many years. Rick is passionate about his breed, and works hard to promote their good nature. While attending RKOC demos in the community, children who are cautious of the Doberman breed quickly come to enjoy petting and playing with Rick's dogs! Rick has recently added a Standard Poodle to his family. Rick is a diligent trainer, and keeps current on various training methods by attending seminars, taking classes from other instructors, reading books, internet articles and watching instructional videos. Rick is very passionate about helping dog owners achieve the level of training they want for their dogs and has successfully assisted many owners with problem dogs who were unable to obtain the desired level of help elsewhere. He has a gentle, quiet nature to which dogs of all breeds respond positively! Rick looks forward to working with you and your dog! Sarah joined the RKOC in the spring of 2010 and began teaching agility in the summer of 2012. Sarah enjoys watching people and dogs become more confident on the agility obstacles, while forming a closer working bond. Sarah has achieved a Rally RNCL title on two of her dogs, and has flyball titles on another. She currently competes in Rally-0, and flyball. Sarah's dog family includes three All-Canadians (a corgi mix, a german shorthaired pointer mix, and a border collie mix) and a border collie. She has also owned Toy Poodles. Val is a life member of the RKOC, and has been instructing since 1985. For years, she instructed beginner obedience but her preference now is conformation show handling. Since 1981, Val has shown over 55 breeds, encompassing all 7 groups, to Canadian championships, American championships, as well as numerous Best in Shows, Best Puppy in Shows, group wins and placements. Everything from Miniature Pinschers to Saint Bernards! Val's dogs have won over 55 All Breed Best in Shows, 50 Best Puppy in Shows, and numerous Best in Specialty and Best Puppy in Specialty wins. Val's Old English Sheepdogs and Lhasa Apsos achieved titles in CKC Companion Dog, Companion Dog Excellent and Canine Good Neighbour. 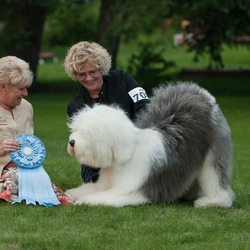 Chumley, her first Old English Sheepdog (OES), was a member of the PCA Pacer Scent Hurdle Racing Team and won the Canadian nationals two times as well as being a member of one of the first SuperDog teams, performing at the PNE Exhibition in Vancouver. Val now focuses on showing her home-bred OES, the most recent being Multi BIS, BPIS, BPISS, GR Ch. Valubal Burn Notice CGN. In 2011, Westen was the Top Puppy, All Breeds in Canada, #2 OES and broke records for being the youngest BIS winner (at 8 months), youngest Grand Champion, youngest CGN qualifier. He also broke the record for the number of Puppy in Shows won by an OES. Two other dogs bred and owned by Val placed #3 and #5 in Canada in 2011. In 2005, Am Can Ch Lambluv Gala Affair, co-owned and bred by Cathy Schellenberg, was #1 Herding Dog in 2005, and still holds the record for the most Best in Shows won by an OES. Val has instructed several weekend handling seminars, OES judging seminars and has judged specialty sweepstakes in the United States. Val looks forward to helping new handlers optimize the presentation of their dog. 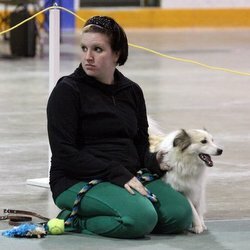 CKC obedience ( novice, open and utility). Because of health issues Vicky now instructs the puppies/small dog beginner obedience classes. Vicky continues to be a valued mentor to dog/handler teams competing in many disciplines! Vicky has achieved titles on German Shepherds, American Cocker Spaniels, Shih Tzus, and Coton de Tulears. These include Canadian Kennel Club, United Kennel Club, and American Kennel Club conformation championships, Canadian Kennel Club PCD, CD and CDX obedience degrees, and Canine Good Neighbour titles. In addition, for many years Vicky's dogs raced on scent hurdle teams and dog/horse relays for Therapeutic Riding. Vicky has attended Bob Self obedience seminars in the USA as well as many local seminars over the years. She is a wealth of information that we regularly count on! Vicky enjoys seeing the delight on a new dog owner's face when their pet accomplishes a feat that the owner thought they couldn't do! Even though our instructors voluntarily dedicate their time to instruct classes, they must be completely qualified. Each instructor must have attended and worked a dog through three sets of training classes before apprenticing to become an instructor. Once that has happened, they must apprentice under 3 different instructors and receive positive critiques from all 3. When teaching the first set of classes there will be an experienced trainer also in attendance. All teaching begins at the beginner/puppy class level.